I jumped the gun and HAD to try the hat on Mr. Max before gifts were exchanged... I just couldn't resist! It's not like he knows it was supposed to be a gift anyway, right? Without further delay, here he is - and the hat is a perfect fit, with just a little room to grow. 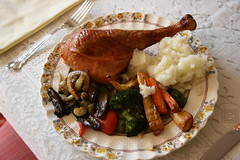 (Back story: My family JUST congregated last night for our family Christmas celebration) - tonight will be Christmas Eve, complete with a Thanksgiving-like turkey meal, as requested by my sister who lives abroad where there is no Thanksgiving. As is traditional in our family, we will open most Christmas gifts tonight, after an early-ish dinner. I always loved that when I was a kid - after I opened my presents, I ran to the phone to tell all of my friends what I got, and they were always VERY envious that I had gotten my gifts a full 12 hours before they had! Tomorrow will be Christmas day, where we open up our stockings. When we were younger, "Santa" filled the stockings, but now that we are all much older, we pick names from a hat and fill the stocking of a family member; it takes the burden off of Santa. It's fun to try and guess who filled your stocking! Stay tuned for more Max pics... I've already taken a bunch! I'm pretty sure that Max doesn't read my blog, and for that matter, I'm fairly certain my brother doesn't, either, so I think I'm safe in posting this - I just couldn't wait! Of course, I'll post more photos once I actually get the hat onto Max's wee head, don't worry. Isn't it cute? 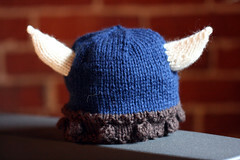 I hope he enjoys wearing it as much as I enjoyed making it! 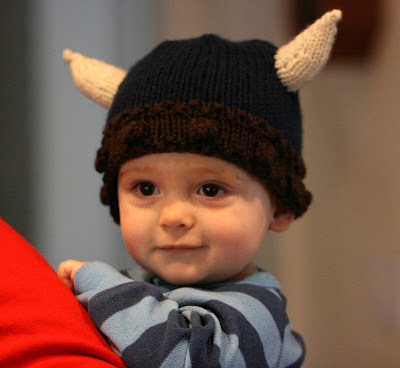 I basically followed the Viking Hat pattern by Becky Veverka, with a few changes: I had a different gauge, so I cast on fewer stitches, and also rewrote the pattern for the horns so that they were a bit smaller and so that they could be worked in the round... ANYTHING to avoid seaming! Well, after being at this job for 3 1/2 years, I FINALLY have an inhabitable office! They came in and gave me a thermostat that WORKS, and set the temperature to a very bearable 68 degrees. For some reason, it still gets up to 10 degrees warmer than that at times, but not because hot air is pumping into the room, but maybe just because I"m on the top floor and in the middle of the building. I can live with that. After all, it's below 90! Woo! The Holidays: The Problem, and The Cure! We all know what the problem with the holidays is... rushing around, trying to find gifts for everyone, cooking cleaning, party hopping, and whatever else is unique to your own life. For me, my regular job is extra busy around this time... when teachers are stressed, kids are stressed, which stresses teachers out even more, which stresses kids out to the max! My office has been a busy place, because it's one of the places stressed kids get sent. In addition, it's the busy season for selling jewelry, and I spent the first two weekends in December at my studio, selling things. This past week, I brought my jewelry in to work, brought it to our monthly social work staff meeting, and then brought it to knit night up in New Hampshire. By the end of this week, I was totally frazzled! Friday night, I was so 'on' that I really couldn't sleep. I woke up in the middle of the night, going through checklists of things that still need to be done, FINALLY fell back to sleep, and was then awakened at 5:50 AM by a terrifying zombie dream. TERRIFYING! My heart was in my throat, and I think I woke up gasping in fear. At that point, I gave up on getting any more sleep, and just got up for the day. So, we are quite close to the end of 2009 now, and I have to say that my budgeting resolution for the year has been a screaming success! To recap, I had a goal of decreasing wasteful spending, so that I could start paying down my debt more aggressively. I reviewed all of my bills, cut down monthly expenses where I could (I STILL miss my DVR, sniff), started writing down every penny I spent, and started working various extra jobs as they came my way. I have kept up with the blistering repayment pace I set for myself, and will continue to do so until the only debt I have left is my main mortgage. At this rate, this magical date will be approximately 30 months from now, and I can hardly wait! I had never been much of a resolution maker until a couple of years ago... but in 2008, I resolved to reduce my use of plastic bags, and that went quite well, too. I am still using reusable shopping bags on a very regular basis. I am still shopping around for ideas, though... and still have a couple of weeks to decide! I'm kind of glad this is the time of year to be bustling around, shopping, and preparing for the holidays, because otherwise, I might get around to noticing that it's pitch black out there most of the time I'm not at work! We're getting closer and closer to the date when the days start getting longer again, though, and I'm grateful for that. I know nobody likes getting to work and leaving from work in the dark, so I won't claim that I'm special and deserve your sympathy, because I know you're probably in the same boat, too! I also think it is cruel to design work offices without any natural light... I neeeeeeeed to see the sun, please! I only took one picture all day. ONE! But, it was a good one!